(Phys.org)—This composite image shows the distribution of dark matter, galaxies, and hot gas in the core of the merging galaxy cluster Abell 520, formed from a violent collision of massive galaxy clusters that is located about 2.4 billion light years from Earth. Data from NASA's Chandra X-ray Observatory show the hot gas in the colliding clusters colored in green. The gas provides evidence that a collision took place. Optical data from NASA's Hubble Space Telescope and the Canada-France-Hawaii Telescope (CFHT) in Hawaii are shown in red, green, and blue. Starlight from galaxies within the clusters, derived from observations by the CFHT and smoothed to show the location of most of the galaxies, is colored orange. The blue-colored areas pinpoint the location of most of the mass in the cluster, which is dominated by dark matter. Dark matter is an invisible substance that makes up most of the universe's mass. The dark-matter map was derived from the Hubble observations, by detecting how light from distant objects is distorted by the cluster galaxies, an effect called gravitational lensing. The blend of blue and green in the center of the image reveals that a clump of dark matter (which can be seen by mousing over the image) resides near most of the hot gas, where very few galaxies are found. This finding confirms previous observations of a dark-matter core in the cluster announced in 2007. The result could present a challenge to basic theories of dark matter, which predict that galaxies should be anchored to dark matter, even during the shock of a powerful collision. No, the gas provides evidence that in the space surrounding massive galaxies, that nucleation of new matter slowly takes place, not that galactic collisions took place. Dark matter halos surrounding our galaxy has recently been established. Further, dark matter has been found to be largely absent within our galaxy. Dark matter presence is inferred from light refraction. The region of space in a critical state for nucleating new matter is that empty space surrounding large masses like galaxies. This type of space can refract light in LaViolette's SubQuantum Kinectics. Thus, the region sandwiched between these massive clusters is a prime example of this effect. Cosmology as science must progress from adding further confusion to clear any feasible ambiguity. The state of anarchy prevails -Dark matter, Dark Energy and Super-imposed ignorance through gravity. 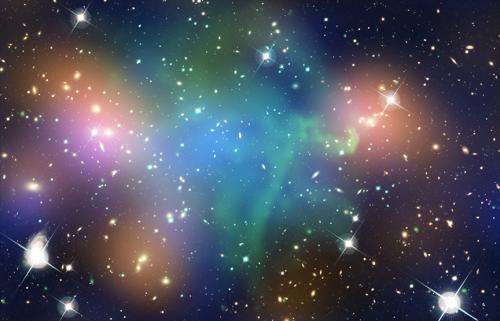 Wisdom must prevail to understand the cosmic function at this scale-Abell 520 at 2.4 Billion LY, and distribution of Energy which must be evident from and beyond 100,000 Light Years- I call it heart and Center of Universe. Uplink mode will be different from the Downlink mode towards milky Way Frame. But since it's a mouthful, we refer to this group of phenomena as 'dark matter'. My guess is the editors saw February and threw it up. Not noticing that it was Feb 2012. Very funny. Because the astrophysicists are losing mutual contact about their research and they just pile random publications like the robots. Aether has mass. Aether physically occupies three dimensional space. Aether is physically displaced by matter. There is no such thing as non-baryonic dark matter anchored to matter. Matter moves through and displaces the aether. Galaxy clusters move through and displace the aether. A 'new dark force' is more speculative than understanding space itself has mass. It's not a new force. It's the aether displaced by each of the galaxies interacting analogous to the bow waves of two boats which pass by each other. The Milky Way's halo is what is referred to as the curvature of spacetime. The Milky Way's halo is the state of displacement of the aether. The geometrical representation of gravity as curved spacetime physically exists in nature as the state of displacement of the aether. Displaced aether pushing back toward matter is gravity. Good lord what a cluster doink of quacks. God forbid any article mention DM and the quacks gather like, well, ducks to a pond. Aether has mass. .. There is no such thing as non-baryonic dark matter anchored to matter. If your hypothetical aether has mass and isn't made of baryons, it qualifies as "non-baryonic dark matter". Matter moves through and displaces the aether. That would create drag, orbits would decay. Matter would have to move through the aether without displacing it just as neutrinos pass through the Earth (but it needs to be a solid to explain optical polarization). Non-baryonic dark matter is hypothesized to be anchored to matter. Matter moves through and displaces the aether. That would create drag, orbits would decay. The incompressible fluid described in the following article is the gravitational aether. The following article describes a 'back reaction' associated with the "fluidic" nature of space itself. This is the displaced aether 'displacing back'. The aether is, or behaves similar to, a supersolid. The following article describes the aether as that which produces resistance to acceleration and is responsible for the increase in mass of an object with velocity. The relativistc mass of an object is the mass of the object and the mass of the aether displaced by the object. Normal matter is "anchored" to dark matter only by its gravitational interaction. You said your aether had mass which would mean it would also produce and be affected by gravity. If it doesn't interact with EM then it meets the requirements to be dark matter.